Enjoy a night of music on February 12, at 7 pm, in the Syracuse High School auditorium as the Symphony Orchestra presents Love That Jazz! The event is, once again, free to the public. The Theater Committee is now accepting letters of interest for the production team of Hairspray the Musical. Please email volunteer@syracuseutaharts.org if you would like to serve as Assistant Director, Music Director, Choreographer, Set Designer, or Publicity Manager—or even just help in other areas of the production. Be sure to include some background, any experience, and dates of other commitments that might conflict with the production from April to July. The Arts Council Board is always looking for fresh ideas and the hands to help make them happen. Plans are in the works to expand the opportunities for residents to enjoy participating and watching more programs this year by creating a choir, a junior theater program, and additional theater productions. The Board has three terms ending this June. If you enjoy the arts, are willing to serve your community, and would like a fun opportunity to interact with great people while promoting culture through the performing arts, email your interest to serve on a committee, such as sponsorships, junior theater, choir, etc., or on the General Board at the address listed above. Board meetings are usually held the first Wednesday evening of each month. These meetings are open to the public, and visitors and input are always welcome. Scott Sneddon spent nearly 21 years in Air Force as a Military Police Officer. Even though he worked as an officer at his day job, Scott has always had a passion for photography. He would set up a photography studio where ever he was currently assigned around the world. He has had studios in California, Germany, Korea and finally he settled here in Utah. The idea for DIY Photography Studio arose when he was looking for a local place to take maternity photos of his wife Aple in 2011. He couldn’t find a place that would take the quality of photos he wanted nor could he find a studio that would let him rent the studio to take the photos himself. He later managed a Target Portrait studio and was consistently asked by professional photographers if they could rent out the space which was against Target’s policy. With that in mind, Scott set out to create a photo studio for professionals and do-it-yourselfers to rent out and have the best in lighting and settings for their photo shoots. DIY Photography Studio was born in 2015. Because of Scott’s background and experience in studio photography, he often trains professionals in studio photography. As he was training photographers and they were utilizing his state of the art facility he realized another need. Photographers were always looking for a place to have their photos printed. Many were opting for online sources but quality control was not the best and often the turn-around time was too slow. Scott purchased his first high end printer and started creating high quality prints for his students and friends. Word got out of his quality and attention to detail and within 2 months, the printing business was producing as much as his photo studio. He later expanded to the open office space next door and created a full featured photography printing business open to the public. After attending a large format printing conference in Las Vegas, Scott learned about a new technology called Metal Sublimation. This process chemically bonds the colors of a photo to metal. It doesn’t fade, scratch and the colors just pop. They are really quite beautiful with much more clarity than printing on paper or canvas. Scott was offered a loan at his bank especially for Veterans that allowed him to purchase the equipment for creating metal sublimation prints and it is by far his favorite way to print photography. Scott spent the first year, after purchasing the equipment, going around to photography clubs educating them on the process and showing them the results. Today the word is out and everyone is starting to realize how awesome metal prints are. He is one of only 3 studios in the entire state that can handle larger metal prints. In fact some of the larger photography studios fulfill their metal prints through DIY Photography because they cannot do it themselves. The nice thing is, his shop is just around the corner and you can go directly to his shop and have them done without the middle man. DIY Printing prides themselves on quality. With the eye of a professional photographer, they turn out the very best quality and they can often do very quick turn arounds. Just the other day, they were approached by a wedding photographer who needed some photos printed for that evening’s reception and DIY was able to make it happen. It is great to have a such a stellar resource near by. We appreciate DIY supporting the magazine and recommend their services. Scott met his wife Aple while serving in Korea and later married her in her home country, the Philippines. They have 2 children 6 year old boy, Dillon and nearly 5 year old girl Leianna. Syracuse City encourages every citizen to sign up for our CodeRED notification system. By simply entering your phone number into this service, we can notify you in the event of a city-wide or county-wide emergency. Please take a moment to fill in the appropriate information to be notified by your local emergency response team in the event of emergency situations or critical community alerts. Examples include: evacuation notices, bio-terrorism alerts, boil water notices, and missing child reports. Please got to www.syracuseut.com and follow the prompts to sign up. It is free to sign up, and takes less than five minutes. According to the National Fire Protection Association and the United States Fire Administration, space heaters annually account for 40% of reported U.S. home heating fires. Please practice extreme caution when using space heaters this season. Keep things that can burn at least 3 feet away from space heaters, and create a three-foot “kid-free zone” around them. Make sure to use equipment that has the label of a qualified testing laboratory, and have a qualified professional install stationary heating equipment according to local codes and manufacturer’s instructions. Place space heaters on a solid, flat surface, away from high traffic areas and doorways. Turn them off when you go to bed or leave the room. Use and purchase heaters with an automatic shut off so if they’re tipped over they will shut off. Inspect for cracks or damage, broken plugs, or loose connections; replace before using. Winter fires are preventable! Visit www.nfpa.org/winter for more heating safety advice. One of the secrets about Antelope Island that only the locals know is that winter arrives late and it leaves early due to its lower elevation. While trails in the Wasatch Mountains and foothills are covered with two, three, or six feet of snow, many of the trails out on the island are still clear for a nice day hike. In early December, I was fortunate enough to tag along with my son, Miles, and his compadres from local Boy Scout Troop 882 (pronounced eight-eight deuce), on a day hike up to Frary Peak. At an elevation of 6,569 ft above sea level, Frary Peak doesn’t catch the imagination of mountain climber types, but as the highest point on Antelope Island, it furnishes first-class views of the Wasatch Front and the Great Salt Lake. The entire hike takes about 4 to 5 hours and has an elevation gain of 2,050 over 3.5 miles. According to the Antelope Island State Park trail map, the trail is 6.4 miles round trip. 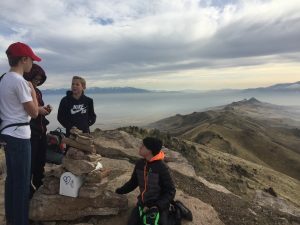 As peak-hiking goes, Frary Peak is one of the easiest in the Salt Lake area. Like many areas of the island, the best time to go is in the fall or early spring. Due to lack of shade, the trail can be a scorcher in the summer unless you attempt it early in the morning or late in the evening. A trail map is available at the entrance gate of the state park. The hike starts at the Frary Peak Trailhead, which is located on the east side of the Island. At first, the trail climbs at a rather steep angle but there are several sections along the way that level off before the escalation continues. Our scouts easily handled the climb, although it might prove a little difficult for young children. Miles and his friends were soon on their way into the backcountry of the island, talking, kicking rocks, and taking pictures with their phones. The trail takes several twists and turns which constantly gives new and interesting views of the island and the lake. In due time we made it to the top where we could look out upon both sides of the island. Our scouts were surprised to find an old mailbox that had been placed on the peak where past hikers have left messages and little odd trinkets for future hikers to enjoy. We stopped for a snack and took some time reading through the journal entries and checking out a Rubik’s Cube that someone had placed in the mailbox. On a clear day, you can see mountain peaks from Juab County all the way up into Box Elder County from Frary Peak. On this day, however, there was fog and inversion down below. We climbed up above the inversion and into the warm, beautiful December sunshine. The views from above almost gave us a sense of floating on an island in the sky as the other mountain peaks jutted up above the inversion and into the blue sky. The quietness of the island’s backcountry is also impressive. In the midst of all the hustle and bustle along the Wasatch Front, our little group was immersed in the quietness of nature. The breeze running along the grass. The wind flowing through the wings of a black bird that was gliding along the cliffs below, and the sounds of our shoes climbing over rocks. If you are like me and you get cabin fever around this time of winter, just remember early spring is around the corner. This can be an excellent time to get out, stretch your legs, and enjoy some sunshine. For most of us in Syracuse, we can easily look across the lake to see the conditions on the island. If the snow is mostly gone, then it’s time for a day hike. Syracuse Elementary will be registering new Kindergarten students for the upcoming 2018-19 school year during the week of March 12-16, 2018. A child who resides within Syracuse Elementary boundaries may register for Kindergarten in 2018-19 if they are 5 years of age on or before September 1, 2018, as required by Utah State Law. If you have a child who qualifies, please call 801-402-2600 to receive registration materials. The onslaught of pink and red hearts, frilly Valentines, the promise of roses, love poems, candy, or jewelry is already upon us. It can only mean one thing: Valentine’s Day and all its romance and loving wishes is around the corner. Valentine, an early Christian, was martyred on February 14th, the same day an ancient Roman love lottery took place annually, and so, once raised to sainthood, St. Valentine somehow transitioned to being the patron saint of lovers everywhere. The holiday has been observed in some form for more than a few centuries, and beginning in the Victorian Era and straight into 2018 people have celebrated this romantic day in high style, spending a lot of money on trinkets to show their affection. But, what was happening in the late 1800s in the pioneer west where life was more hardscrabble and certainly few homesteaders had the time, money, or energy to celebrate a day devoted to love? More than likely, February the 14th was yet just one more day in a seemingly endless winter. Farm life paused for no one or no special day. The cows might still have to be milked, firewood chopped, laundry washed, meals cooked, sick children worried over. There is no hard evidence at the Syracuse Museum that the early residents of Syracuse and the surrounding towns sent Valentine’s cards, planned romantic candlelit meals—gosh, every meal was eaten by candle light or gas lamp. The big cities on the east coast were one world, but out here during that time, roses were unavailable—especially in winter—there were no fine, white tablecloth restaurants, and costly chocolate candy was not an option, especially when money was tight and necessary staples had to be purchased for the family’s survival. So does this mean there was never any attempt at romance or pretty, frilly things? There is one clue at the Syracuse Museum that lets us peek into the world of the average person of that time period: hand-made lace items and delicate crochet creations. Somehow, pioneer women transformed simple cotton threads into gossamer hats, doilies, dress collars, and clothing embellishments. It’s not difficult to envision rough, chapped hands with a crochet hook forming a cap or tatting with bobbins and a pillow to make lace. There are many examples of fine lacework and crocheting on display throughout the museum cases that offer silent testimony to the skill and craft of the pioneer woman. She may have faced long, hard days helping her husband and children carve out a life in the fields, but at some point—perhaps after dinner or on a stormy day—she made time to allow her feminine side to surface as she lovingly made these precious items. One thing on display that speaks volumes is a simple camisole. Skilled fingers from many decades ago added a lacy crochet edge along the neck and shoulder area. Surely, a wife wanted to look appealing to her husband and perhaps this led to a romantic interlude. Hearts? Candy? Flowers in the winter of 1885 in Utah? Probably not. But efforts were made to soften the edges of a hard life with few interludes to celebrate romance. This romance may not have been what we would embrace, but there was love within families and communities that shone through, not on just one special day in February, but all the year round. ♥ Drive to the top of the mountain & go star gazing with lots of blankets to snuggle under. ♥ Pretend your electricity went out & spend the evening relaxing by the fire & reading or playing games in the candlelight (no phones or electronics). ♥ Visit your favorite museum or aquarium & afterwards enjoy some local cuisine. ♥ Hide little love letters around your home for your special someone. ♥ A box of chocolates for each kid (Ryan does that and our kids love it). ♥ Game night! Quality time as a family. ♥ Movie Marathon (Star Wars, Indiana Jones, Harry Potter, Disney, chick flicks (sorry guys),Narnia, etc). ♥ When I was a young girl living in St.George we loved leaving goodies on friends and family’s doorsteps, knock and run. Those that were receiving the goody would try to catch those leaving the treat. We caught my uncle up a tree one year trying to hide from us. It was lots of fun!!! Whip up a batch of these easy Valentine-themed sugar cookies for your loved ones this month! Stuff and eat. It’s so yummy! This is my Mom’s favorite sugar cookie recipe. It truly is the BEST! I loved when my mom made these. I have many fond memories of cutting out the hearts with the cookie cutter, putting them on the cookie sheet and waiting for them to be cooked and cooled so I could decorate them. They always tasted AMAZING! Just thinking back on them I feel the LOVE my mom had for us. It wasn’t about the treat as much as the time she spent with us making them. Mix all ingredients well. Add flour last. Roll out ¼ to ½” thickness on floured surface. Cut with cookie cutters. Place on greased cookie sheet and bake for 10 to 12 minutes at 350 degrees. DO NOT Brown! Frost and decorate. Makes 4 dozen cookies! I love this recipe. It is so easy and delicious! Throw all ingredients in a mixer and beat together for 30 to 60 seconds and it is done. We use this recipe for all our frosting needs: cakes, cinnamon rolls, and of course sugar cookies! During the months of December through March, you may use your green can for regular household waste. For more information, contact the utility department at 801-825-1477, option 1.